Opposition to the use of the term libertarian Republican comes from the libertarian adherence to the non-aggression principle, advocating that the initiation of force against the life, liberty or property of an individual is immoral, and to which the Republican Party platform and its ideological base of neoconservative partisans do not adhere. The Republican Party is divided into factions. In a 2014 Pew Research Center survey on political typology and polarization survey, 12% of Republicans described themselves as libertarian. The libertarian branch of the party is smaller than other branches, including "Main Street" voters (pragmatic, establishment-supporting, open to more compromise), Tea Party voters (radical right-wing populists with "a deep mistrust of experts, elites and even the G.O.P. establishment"), and Christian conservatives (dominated by white evangelical voters, mostly from the South). However, the libertarian bloc in the party is larger in size than several other groups, such as former Northeastern moderate Republicans (which have almost disappeared) and hawkish "national security" voters who favor neoconservativism. Compared to other Republican factions, libertarian Republicans have relatively little party loyalty. According to a 2012 New York Times analysis, libertarian Republicans have a variety of motivating issues. On economic and domestic policy, they favor cutting taxes and regulations, repealing the Affordable Care Act, and protecting gun rights. On social issues, they favor privacy and oppose the USA Patriot Act, support abortion rights, and oppose the War on Drugs. On foreign and defense policy, libertarian Republicans are "fiercely isolationist." Two-thirds of libertarian Republicans are males. The Republican Liberty Caucus, which describes itself as "the oldest continuously operating organization in the Liberty Republican movement with state charters nationwide," was founded in 1991. Among the group's past chairs are Chuck Muth. 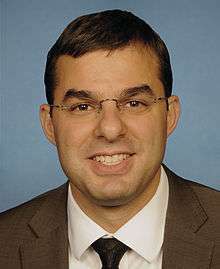 The House Liberty Caucus is a congressional caucus formed by Representative Justin Amash, Republican of Michigan. In 2014, the group "consisted of about 30 libertarian-inclined Republicans (and occasional Democratic visitors like Jared Polis)." The group is a rival to the conservative Republican Study Committee, which favors high military spending. Representative Thomas Massie of Kentucky - described as "a Northern Kentucky Republican with libertarian leanings," Massie is a "self-styled libertarian" who has received libertarian support, although he has also described himself as a "'constitutional conservative' within the Republican Party." Representative Mark Sanford of South Carolina (also a former governor of South Carolina) – often described as a figure with libertarian views; claimed to have turned down an offer from Libertarian Party presidential nominee Gary Johnson to be his vice presidential running mate in the 2016 election. Former Representative Connie Mack IV of Florida – described as "a staunch fiscal conservative...with libertarian tendencies." 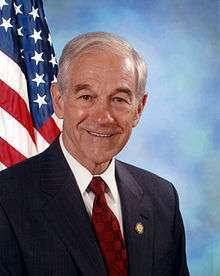 Former Representative Ron Paul of Texas – longstanding Libertarian Republican icon; unsuccessfully ran for president in 1988 as the Libertarian nominee. Former Representatives Howard H. Buffett of Nebraska, Ralph W. Gwinn of New York, Frederick C. Smith of Ohio, and H.R. Gross of Iowa – members of the House described by Murray Rothbard as "extreme right ... solidly isolationist and opposed to foreign wars and interventions, and roughly free-market and libertarian in domestic affairs." Senator Jeff Flake of Arizona – Nick Gillespie of Reason magazine described as a "hard-core free-marketer and libertarianish legislator," while the Washington Post described him as sticking "to his free-market, often libertarian principles even as the [Republican] party has hardened around other positions." 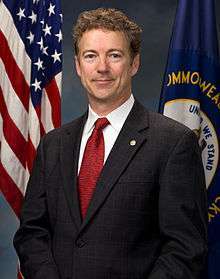 Senator Rand Paul of Kentucky — is sometimes regarded as libertarian-leaning, although David Boaz of the Cato Institute notes that "Paul doesn't claim to be a libertarian, and he takes positions that many libertarians disagree with." 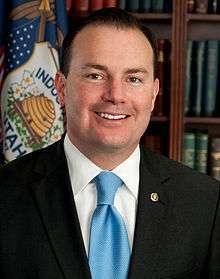 Senator Mike Lee of Utah – described as an economic and civil libertarian. Former Governor Gary Johnson of New Mexico - served two terms as governor as a Republican, but switched from the Republican Party to the Libertarian Party in 2011). Former Governor William Weld of Massachusetts - As a Republican governor of Massachusetts, Weld was identified with a "brand of New England Republicanism" and did not hold libertarian positions. Later, Weld drifted toward the Libertarian Party. In 2006, Weld unsuccessfully sought the Republican nomination for New York governor; he gained the gained the Libertarian Party endorsement that year before dropping out of the race; in 2016, Weld unsuccessfully ran for vice president as the running mate of Gary Johnson on the ticket of the Libertarian Party, which Weld has never previously belonged to. Kurt Bills, former Minnesota state representative; describes himself as a "libertarian-leaning constitutional conservative"; Reason magazine writes that "most of his positions align with mainstream libertarian ideas. He is hostile to the drug war, favors a non-interventionist foreign policy, and embraces Austrian economics." Laura Ebke, Nebraska state senator - elected to the legislature in 2014 and advanced libertarian positions. She described herself in early 2015 as "a Republican and a conservative libertarian," In 2016, Ebke switched to the Libertarian Party. Richard Tisei, former Massachusetts state senator and state Senate minority leader; identifies as a "traditional Northeast libertarian" in the social and fiscal senses. Clint Eastwood, actor, filmmaker – describes himself as a libertarian and says that he has "always been a libertarian," but is associated with the Republican Party. Eastwood spoke at the 2012 Republican National Convention, and voted for Republican nominee John McCain in 2008. Jack Hunter, Charleston, South Carolina radio talk show host ("The Southern Avenger"), political commentator, former aide to Rand Paul, editor of Rare Politics – has written of his "attraction to libertarianism." Hunter was a longtime defender of the Confederate flag and expressed neo-Confederate views, which libertarian commentator and law professor Ilya Somin criticized in 2013 as inconsistent with libertarianism. In 2015, Hunter stated that he was wrong about the flag. Dennis Miller, television personality – described himself as a "conservative libertarian" in the 1990s, although "his commentary always contained a streak of right-wing populism." After the September 11 attacks, Miller's views, particularly on foreign and defense policy, drifted further to the right. Grover Norquist, anti-tax activist and Republican figure; economic libertarian identified with "support for supply-side economics and skepticism about climate science." P. J. O'Rourke, humorist, author – longtime libertarian-conservative Republican, although he endorsed Democratic nominee Hillary Clinton in the 2016 presidential campaign. Peter Schiff, investment broker – described as "libertarian" or "libertarian-leaning"; unsuccessfully sought the Republican nomination for the 2010 election for U.S. Senate in Connecticut. Peter Thiel, Silicon Valley businessman, Paypal co-founder – a registered Republican and self-described libertarian. ↑ "Libertarianism is based on a single ideal, the non-aggression principle," 11-06-2013. Retrieved March 14, 2014. ↑ "Statement of Principles," 05-2016. Retrieved August 19, 2016. ↑ Jocelyn Kiley, In search of libertarians, Pew Research Center (August 25, 2014). 1 2 3 4 5 6 7 Bill Marsh, Graham Roberts, Xaquin G. V. & Archie Tse, A New Guide to the Republican Herd, New York Times (August 26, 2012). 1 2 History of the RLC, Republican Liberty Caucus (accessed August 19, 2016). 1 2 Robert Drape, Has the 'Libertarian Moment' Finally Arrived?, New York Times Magazine (August 7, 2016). ↑ Garrett Quinn (2012-05-30). "Justin Amash Defends Congress' Only Libertarian Seat: Democrats (and at least one moderate Republican) are taking aim at the "next Ron Paul."". Reason.com. Retrieved 2013-06-24. ↑ Deirdre Shesgreen, Ryan wins speaker's job without Massie, as Ohio Dem considers bid to oust Pelosi, USA Today (November 15, 2016). ↑ Emma Dumain, Snowden Has a Few Defenders on the Hill, Roll Call (June 10, 2013). ↑ Jeffrey Mervis, Meet Representative Thomas Massie: A Constitutional Conservative With an MIT Pedigree, Science (November 21, 2012). ↑ "Rep. Raul Labrador (ID-01) | Young Americans for Liberty". Yaliberty.org. 2012-11-06. Retrieved 2013-07-14. ↑ The earliest libertarian to gain standing within the Republican Party was Dana Rohrabacher. Archived June 26, 2012, at the Wayback Machine. ↑ Josh Goodman, South Carolina's "Libertarian" Governor, Governing (August 4, 2008). ↑ Emma Dumain, Mark Sanford turned down offer to run for Libertarian Party VP, The Post and Courier (June 16, 2016). ↑ "Bob Barr, Civil Libertarian". Reason.com. Retrieved 2013-06-24. ↑ Adam C. Smith & Alex Leary, Maverick Connie Mack keeps GOP Senate field waiting on 2012 run, Tampa Bay Times (February 18, 2011). ↑ John Harwood, Libertarian Legion Stands Ready to Accept Torch From Paul, New York Times (August 25, 2012). ↑ Brian Doherty, After Ron Paul, Then What?, New York Times (February 9, 2013). ↑ Murray Rothbard, The Betrayal of the American Right (Ludwig von Mises Institute, 2007), p. 86. ↑ Nick Gillespie, Great Quotes By GOP Sen. Jeff Flake on America's Failed Cuba Policy, Reason (March 18, 2016). ↑ Mike DeBonis, Why this lone Republican accompanied Kerry, Washington Post (August 14, 2016). ↑ David Boaz, Is Rand Paul a Real Libertarian?, Newsweek (April 6, 2015). ↑ Pascal-Emmanuel Gobry, Mike Lee is the most interesting Republican in Washington, The Week (January 13, 2016). ↑ Nick Gillespie, GOP Should Side with Civil Libertarians Rand Paul and Mike Lee, Not Mitch McConnell and Tom Cotton, on Patriot Act Provisions, Reason (May 20, 2015). ↑ Fools Goldwater Archived March 4, 2011, at the Wayback Machine.. National Review, 7-30-2006. Retrieved April 16, 2011. ↑ Brendan, Michael (2011-03-28). ""Frisbie Hoar was saying then the same things Ron Paul is saying today," Church avers". Theamericanconservative.com. Retrieved 2013-06-24. ↑ "Johnson said he's open to running as a Republican again". New Mexico Telegram. 12 June 2013. Retrieved 16 June 2013. ↑ Kelly David Burke, Gary Johnson Switches to Libertarian Party, Fox News (December 28, 2011). ↑ Times (May 16, 2009). "Butch Otter: Evolution of a Libertarian". Spokesman-Review. Retrieved 2013-07-14. ↑ "Idaho Gov. Butch Otter emerges as leader of nationwide Repeal Obama Care States' Rights movement". Libertarian Republican. 2010-03-18. Retrieved 2013-07-14. 1 2 3 David S. Bernstein, Bill Weld's Libertarian Conversion, New Yorker (June 4, 2016). ↑ Bill Weld Drops out of New York Gubernatorial Race, Associated Press (June 6, 2006). 1 2 Garrett Quinn, Libertarian(ish) Candidates: If you want to find a few liberty-loving politicos, look lower on the ballot, Reason (November 2012). ↑ Don Walton, Laura Ebke a libertarian voice in Legislature, Lincoln Journal Star (February 6, 2015). ↑ Joe Duggan, Frustrated' State Sen. Laura Ebke switches from Republican to Libertarian, Omaha World-Herald (June 6, 2016). ↑ Irene North, Nebraska State Senator Laura Ebke switches parties, Scottsbluff Star-Herald (June 2, 2016). ↑ Milton Friedman on the Charlie Rose Show Archived February 4, 2011, at the Wayback Machine.. PBS, November 2005. Retrieved April 16, 2011. ↑ Beito, David T. and Linda Royster Beito. Isabel Paterson, Rose Wilder Lane, and Zora Neale Hurston on War, Race, the State, and Liberty. The Independent Institute, The Independent Review, Spring-08. Retrieved April 19, 2011. 1 2 Republican Liberty Caucus 2006 Convention Summary Archived July 22, 2011, at the Wayback Machine.. Retrieved April 16, 2011. ↑ David Leonhardt. Free for All. The New York Times, 4-1-2007. Retrieved April 16, 2011. ↑ "Today he is the libertarian-leaning host of The Jerry Doyle Show, a daily three-hour program about politics and culture syndicated by the Talk Radio Network". Jerrydoyle.com. Archived from the original on July 18, 2013. Retrieved 2013-06-24. ↑ Dirty Harry comes clean (Clint Eastwood interview with Jeff Dawson], The Guardian (June 6, 2008). ↑ Jacob Sullum, Clint Eastwood's 'Leave Everybody Alone' Definition of Libertarianism, Reason (September 19, 2012). ↑ Ed Krayewski, A Refresher on Clint Eastwood's Libertarian Politics, Reason (August 31, 2012). 1 2 Ilya Somin, Former "Southern Avenger" Jack Hunter Resigns from Rand Paul's Staff, Volokh Conspiracy (July 22, 2013). 1 2 3 Jack Hunter, The 'Southern Avenger' Repents: I Was Wrong About the Confederate Flag, Daily Beast (June 22, 2015). ↑ Grove, Lloyd. "Lisa Kennedy Montgomery on Her Path From MTV to Fox Business." The Daily Beast. 2013-12-09. Retrieved 2016-02-01. 1 2 3 Duncan Currie, Dennis the Right-Wing Menace?, National Review (July 27, 2003). ↑ Dennis Miller, Los Angeles Times (2016): "Miller's generally libertarian politics took a sharp right turn shortly after Sept. 11. Now with his material falling on the consistently conservative side, Miller makes regular appearances on Fox News staples..."
↑ Hunter, Jack (November 30, 2012). "In Defense of Grover Norquist". The American Conservative. ↑ Jonathan Chait, Should Liberals Be More Grateful to Grover Norquist?, New Republic (February 28, 2011): "[L]ibertarianism has many variations. Grover Norquist is a libertarian, and he has also decided to work entirely through the Republican Party and the conservative movement...The Kochs, like Norquist, define libertarianism primarily in economic terms. And they define economic libertarianism as support for supply-side economics and skepticism about climate science." ↑ PJ O'Rourke, Satirist and Journalist (interview with Matt Wordsworth), Lateline ABC News (Australia) (July 28, 2016): "What drives a libertarian Republican to endorse a big government Democrat?" ↑ P.J. O'Rourke on why Trump will collapse, Ann Coulter's a fraud, and how National Lampoon created modern comedy, Salon (interview with Andrew O'Hehir) (September 24, 2015): "Since at least the mid-'80s, O'Rourke has tried to stake out a zone on the libertarian-conservative wing of the Republican Party." ↑ Quinn, Garrett (September 14, 2012). "An Exit Interview With Wayne Allyn Root". Reason. Retrieved September 14, 2012. ↑ Jason Brennan, Libertarianism: What Everyone Needs to Know (Oxford University Press, pp. 35, 169. ↑ Brian Doherty, Peter Schiff Losing GOP Senate Primary in Connecticut, Reason (August 10, 2010). ↑ Bradley, Richard (December 1, 2014). "The Goat Whisperer". Worth. Archived from the original on December 18, 2014. ↑ Christine Mai-Duc, Silicon Valley tech mogul Peter Thiel to make history as he declares he's proud to be gay on the RNC stage, Los Angeles Times (July 22, 2016). ↑ Ben Smith (September 14, 2012). "They're gay, conservative and proud". Politico. Thiel ... [is] a prominent supporter of libertarian causes.